The Grand Canyon became a National Park in 1919 and is undoubtedly one of the world’s natural wonders. Situated in Arizona, the park is 277 miles long, roughly 18 miles wide and has a depth of more than a mile. The Grand Canyon is carved by the Colorado River and features layered bands of red rock showcasing years of geological history. Grand Canyon National Park is full of many amazing sites and hikes to explore. The Rim-to-Rim hike is one of the longest hikes in Grand Canyon National Park. This path takes hikers from North Kaibab to Grand Canyon Village and is about 44 miles round-trip. It features a waterfall and is difficult, but ideal for hiking, trail running, camping and backpacking. Toroweap Overlook is the ancestral home of the Southern Paiute people and is an isolated and primitive area. It rests at 3000 vertical feet above the Colorado River on the northwest rim of the Grand Canyon and is characteristic of volcanic cinder cones and lava flows, offering a breathtaking and dramatic view. Leading hikers from the south rim of the Grand Canyon down to the Colorado River, Bright Angel Trail is a well-maintained dirt trail that is roughly 9.5 miles long. It provides access to two campsites-Indian Garden Campground and at the Bright Angel Campground. At roughly 18 miles long, with 3,100 vertical feet of climbing, Rainbow Rim Trail lies on the north rim of the Grand Canyon. It connects five large “Points” of land/viewpoints, Parissawampitts, Fence, Locust, North Timp and Timp, which overhang the Canyon and the Arizona Strip. With seven-mile of scenic drive along the canyon rim, Hermit Road offers numerous viewpoints and is considered the most popular route in the park. Some of the best viewpoints can be had from Hopi Point, The Abyss, Pima Point and Maricopa Point. Formerly known as the Horsethief Trail, Hermit Trail, was built in 1911, and is a rocky, strenuous trail that drops almost 2,000 vertical feet the first 2.5 miles. Fossilized animal tracks in the Coconino Sandstone can be viewed on this hike. Located on the South Rim, South Kaibab Trail is a steep and well defined dirt trail, that offer some of the most magical views of the park. The trail’s elevation reaches 7,260 feet and a round-trip cover approximately 14.6 miles. 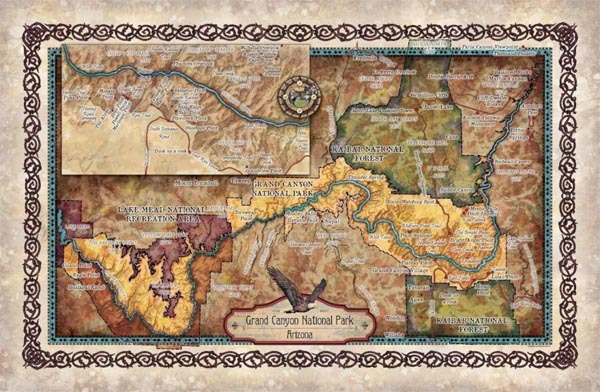 Home to Yavapai Point, Grand Canyon Village is the most popular entryway into Grand Canyon National Park. It is a picturesque historic area that is the transportation hub for the South Rim. Grand Canyon National Park is a breathtaking geological monument that is truly a national treasure.